When I think about how I want Bellingham to grow and what kind of city I want to live in I think about two distinct sets of cities. The cities in Set A all have robust shipping and rail industries. The cities in Set B all have robust financial and high tech industries. Set A has generally higher crime rates and narcotics trafficking while Set B has lots of employment and exorbitant housing prices. Although the cities in Set A are generally smaller than the cities in Set B, what strikes me about a comparison between these cities is how much more resources and business investment has been pumped into thoughtful, well-planned downtown development for the cities in Set B. This comparison causes me to conclude that both economic growth and public safety increase with downtown revitalization. The question is then: Does economic stimulus decrease crime more or as much as investments in public safety infrastructure? 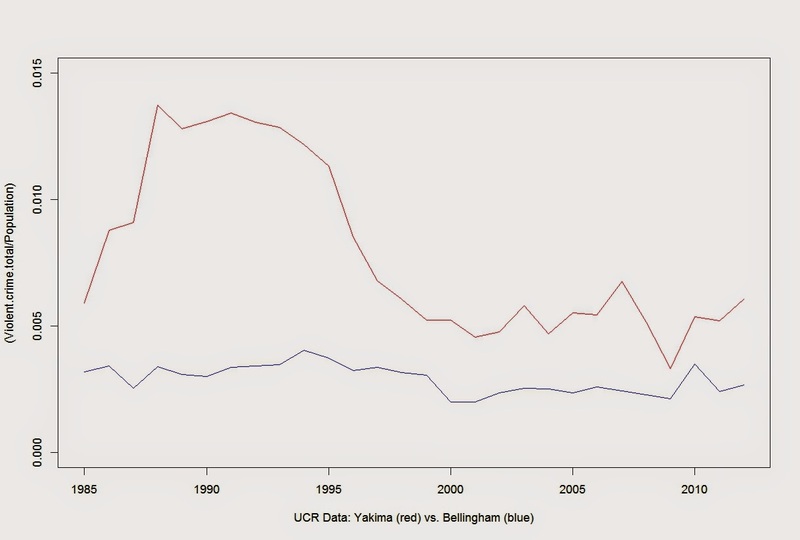 Comparing cities is difficult, but necessary when we want to model our own growth and development path in Bellingham. 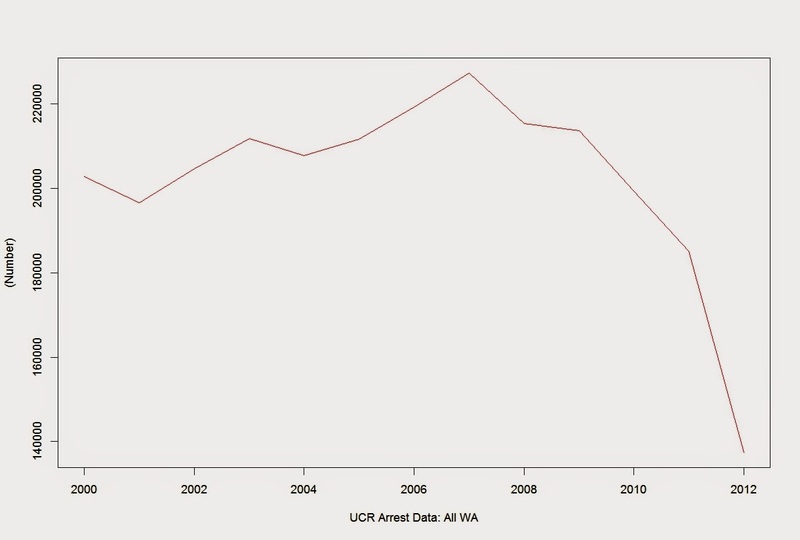 But the FBI and the WASPC warn about using their crime data to do urban cross comparisons. I choose mostly WA cities for the comparisons below. The comparisons have Y scales that use either (a) total volume of violent crime or (b) per capita yearly rates of violent crime. 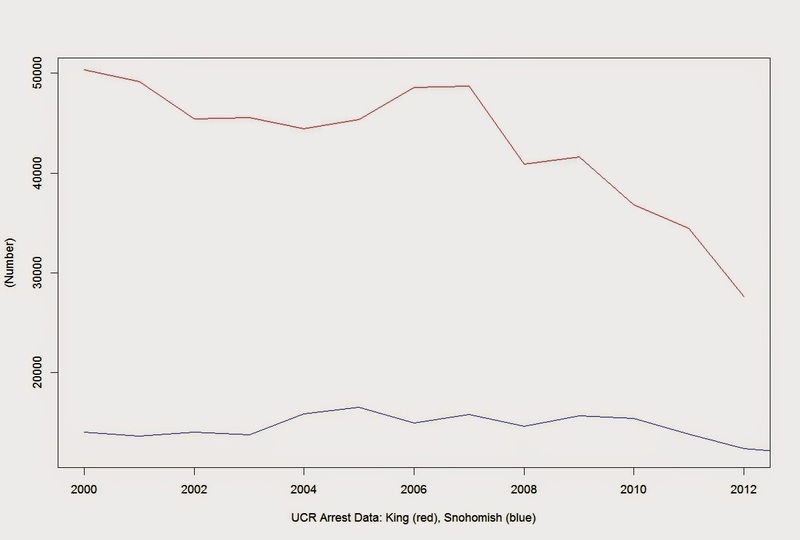 Because of a change in data collection (UCR vs. NIBRS - for which I could find no translation algorithm), I used UCR data for crime up until 2012. NIBRS categories are apparently incompatible with UCR. Since the system has spent the last two years switching over, I will have to cover NIBRS statistics in another post. Click to enlarge the graphs. The charts below come from three different sources of data[1, 2, 3]. For notes on this data see [4, 5]. Oakland and Seattle have similarly sized populations, however Seattle currently has a much larger city and police budget. [6, 7]. 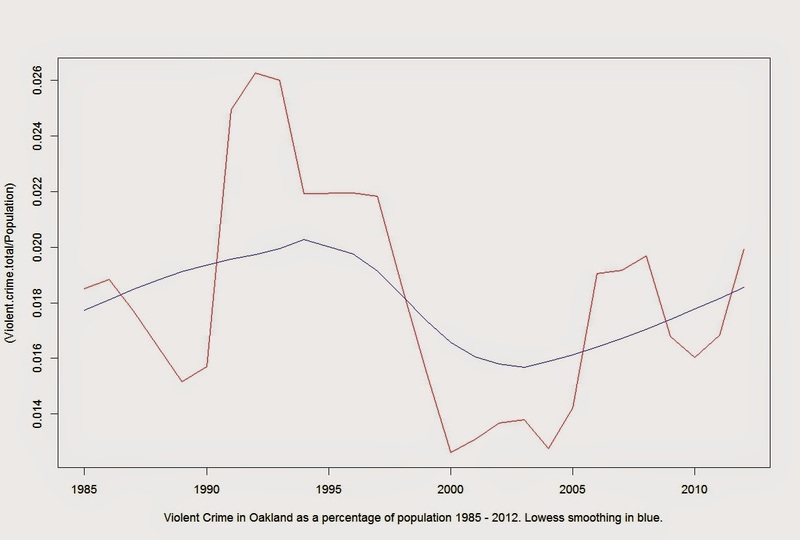 The two cities have not had a comparable amount of violent crime since the early '90s. 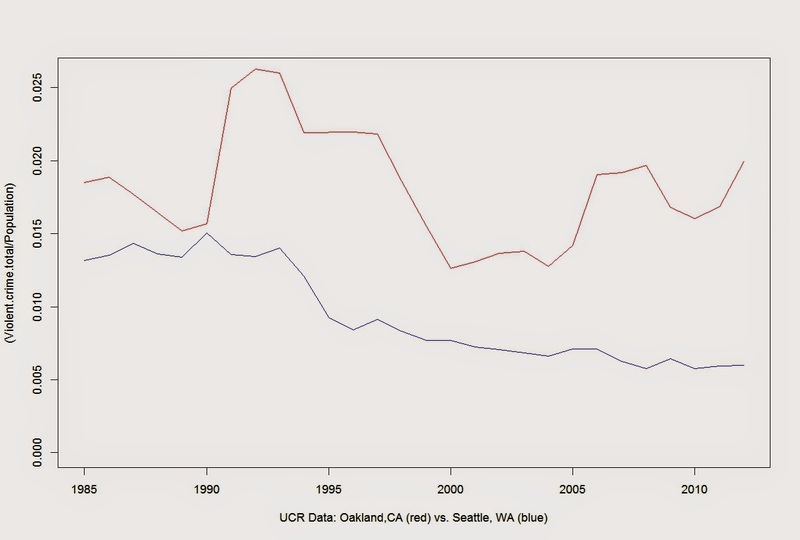 While Oakland has had fluctuation in violent crime since the early 90s, Seattle violent crime rate has been trending lower for over 20 years. Recently, the two cities are farther apart both in volume and per capita rates of violent crime than any point since 1985. We can speculate about the causes, but most would point that some of the advantages of booming high tech industry, gentrification, and rising property values are a wealthier, more involved and more resourced population. Although it is an easy remark to say that Seattle is much less racially and ethnically diverse than Oakland, it is probable that Seattle's population has been in the process of becoming more diverse simultaneous with its 20 year decrease in crime. In addition, vast parts of King County have seen increases in wealth and employment in the past ten years. 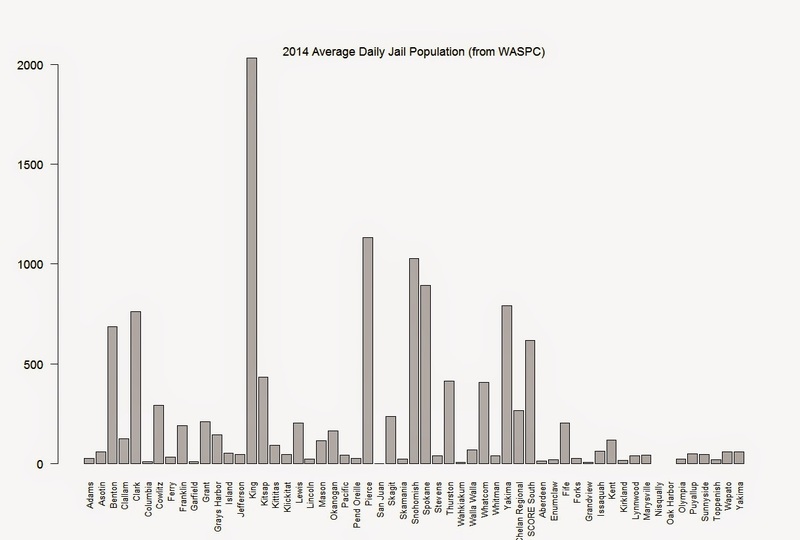 WASPC provided 2014 statistics currently show that King County 'Jail Capacity' (2593) currently exceeds its 'Average Daily Population(inmate)' (2031). More on jail capacity at the end of this post. Adding 'lowess' (e.g. 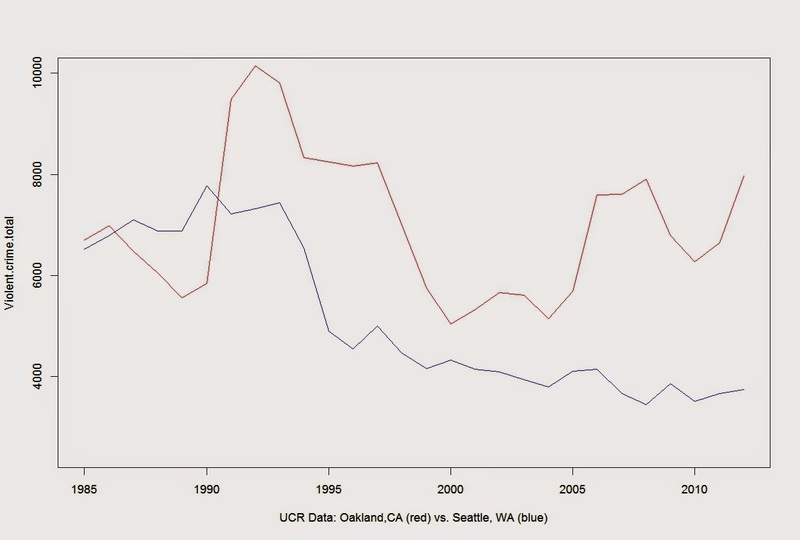 a classic and popular least square regression routine) smoothing lines to the two cities show Oakland on a bumpy roller coaster ride of crime waves vs Seattle's steady descent over the last two decades. 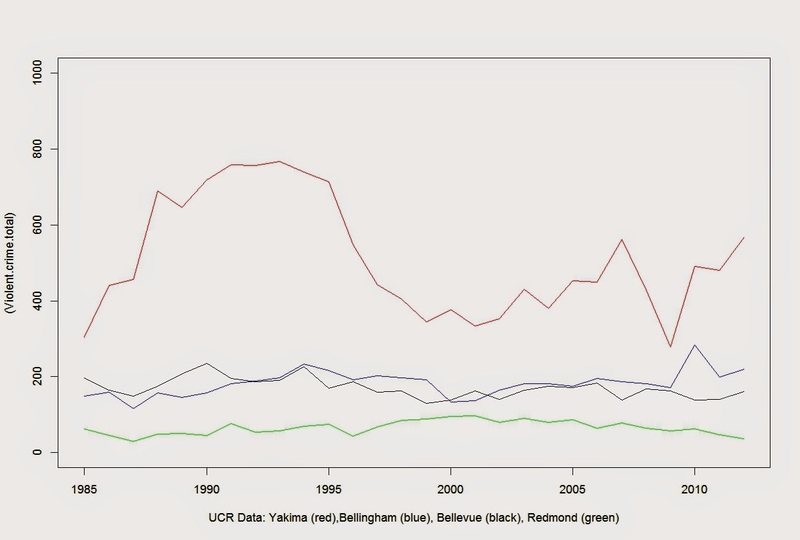 Bellingham and Yakima are very comparable cities by population. Both cities are geographically isolated from other cities similarly sized or larger. Their respective counties (Yakima and Whatcom) have some similarities in industry and agricultural profile although Yakima county has a much greater poverty rate and more racially diverse population than Whatcom County. 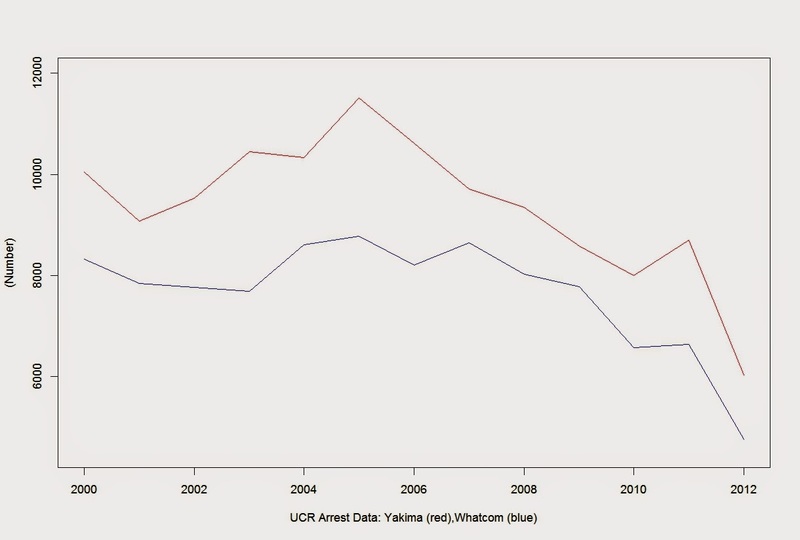 Yakima has greater amounts of violent crime both in volume and per capita. 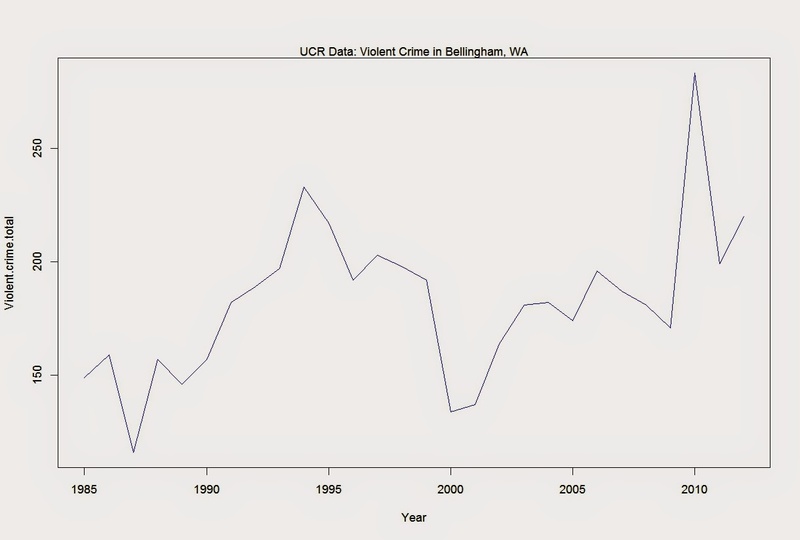 Over the last twenty or so years, Bellingham's highest yearly totals in violent crime are comparable to Yakima's lowest totals. 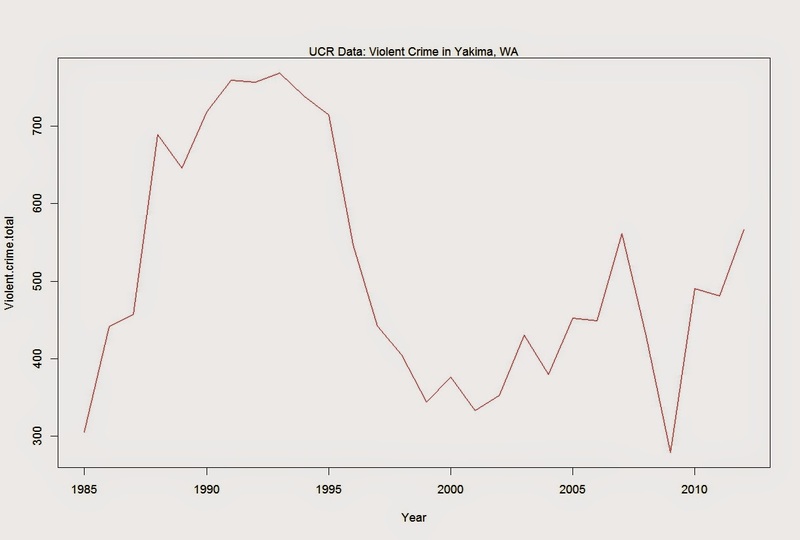 That being said, per capita statistics show Bellingham and Yakima's violent crime rate tracking much closer since 2000, largely due to a drop in Yakima's violent crime levels. 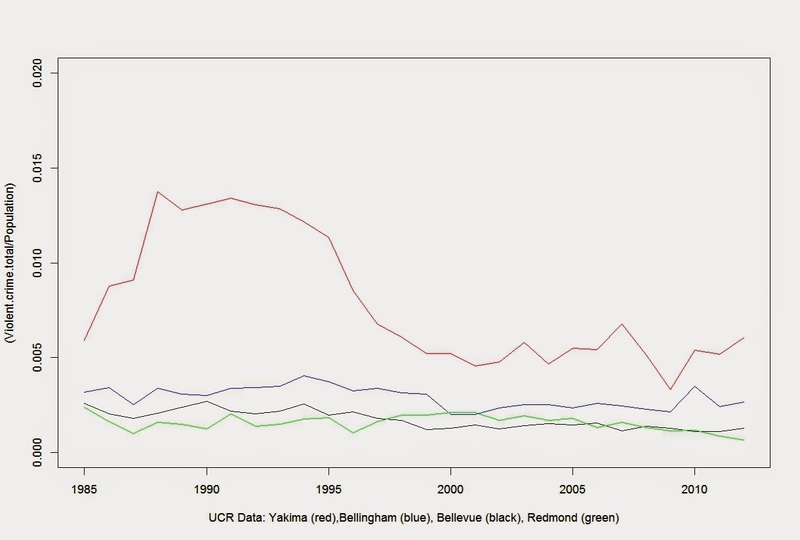 Redmond (55K) and Bellevue (126K) are two 'east side' King County cities whose high tech, high finance profiles probably differentiate them in any economic comparison from Bellingham or Yakima. 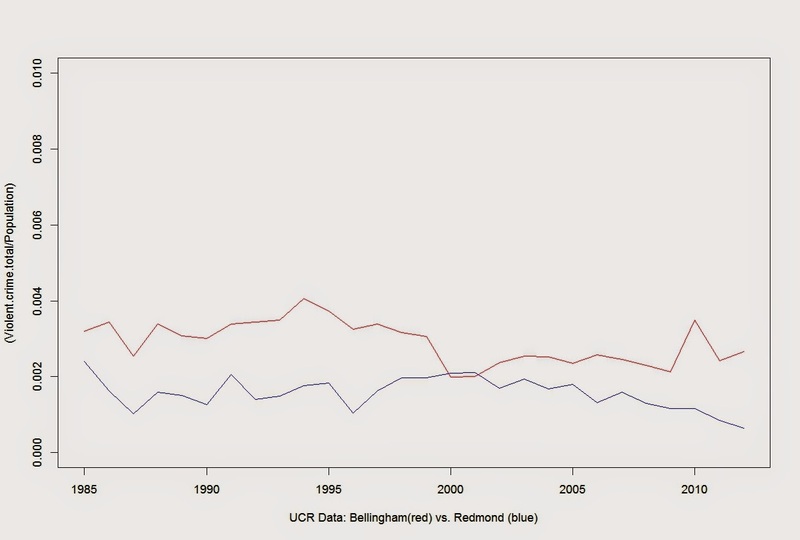 Both Redmond and Bellevue have lower per capita violent crime rates than either Bellingham or Yakima. 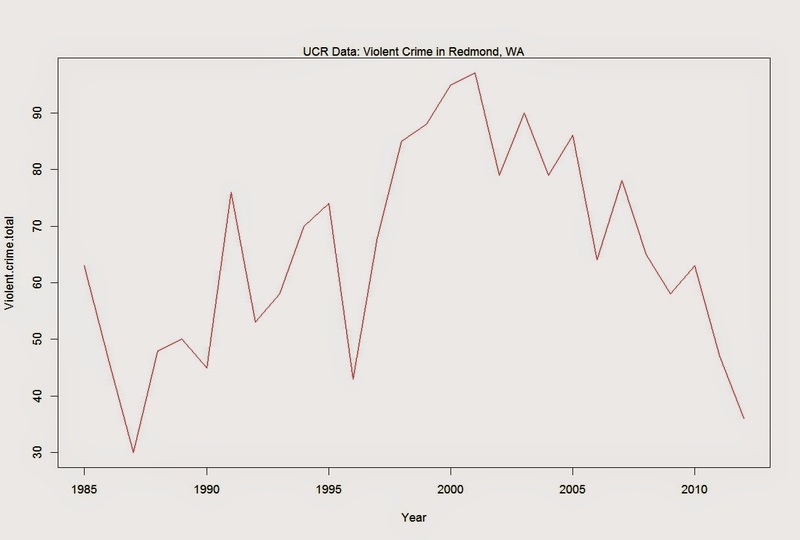 Violent crime rates in both Redmond and Bellevue appear to be tracking downward over time. As in the Seattle/Oakland comparison, once is tempted to remark that if there are tradeoffs to be made in city development, one can only criticize gentrification and high housing prices so much. It should be noted that because of high tech hiring in Seattle's east side, cities like Redmond, Bellevue, Issaquah, Sammanmish contain very high Asian and Indian populations. Unlike Oakland (or perhaps Yakima), Seattle 'east side' does not suffer as strong correlation between race and /or poverty and crime. In all of these sets of comparisons, I am immediately struck by the value of education, wealth and high tech employment in creating public safety as a side effect of economic growth. 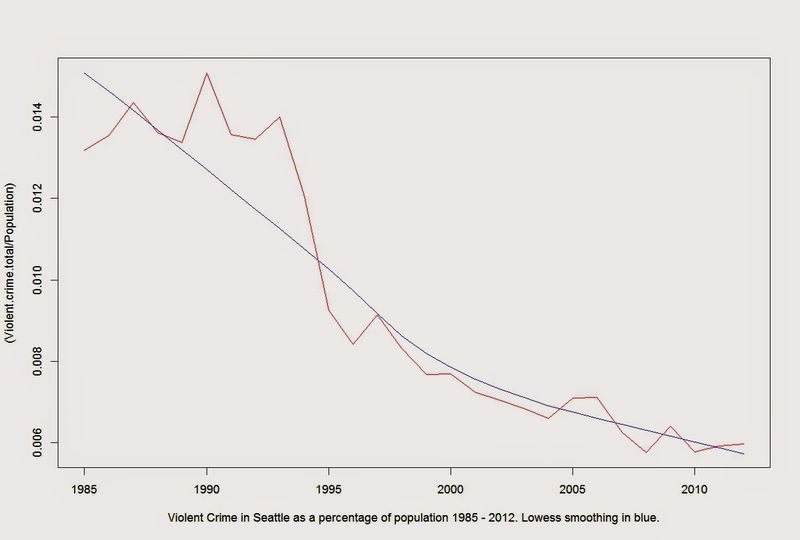 Bellevue, for example, often has lower amounts of violent crime yearly than Bellingham, despite having 45K plus more residents. Jail resources have travel distance limitations which prevent them from being shared economically. There is a difference of 2,897 beds between the Design Capacity and the Average Daily Population of all facilities in WA that hold prisoners. 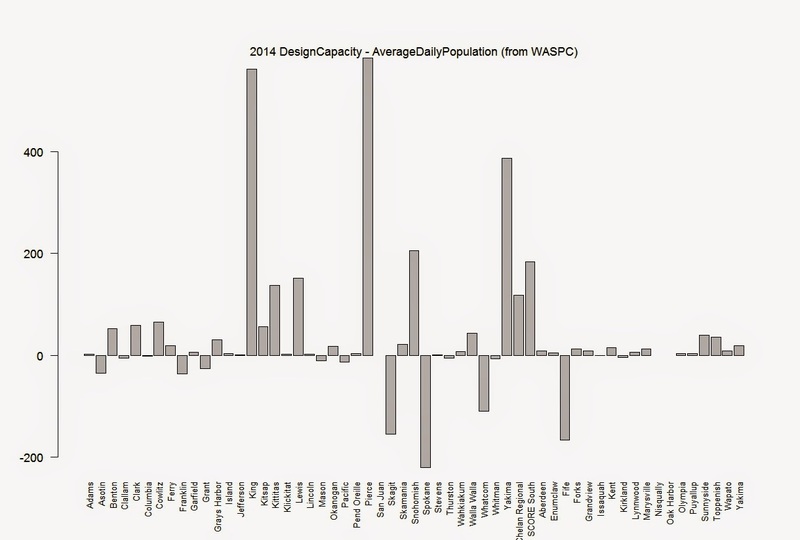 That same vector gives a us a shortage of 799 beds for those facilities whose Average Daily Population exceeds their Design Capacity. Both Skagit and Whatcom County are remarkable for this 'over booked' state. I believe we currently task Snohomish to hold prisoners that would be legally overbooked here in Whatcom. 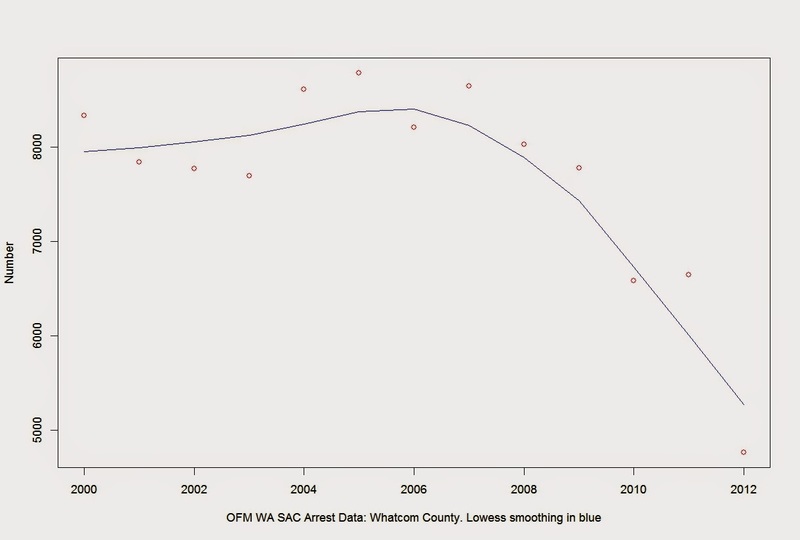 We could legitimately ask whether or not Whatcom County would hold Skagit County overbookings if we built a larger jail than they have planned to build now.